Anyone know off the top of their head who the leading college scorer of all time is? If you said Pete Maravich, give yourself a pat on the back. Second question: how about the leading college rebounder? That’s right, Faried, a relatively unheralded recruit from Newark, NJ, has more college rebounds than Tim Duncan (one of very few NBA superstars who actually played all four years in college). Coming out of Technology High School, Faried only attracted interest from Marist and Iona colleges, choosing to play in the Ohio Valley Conference where he was a centre despite standing “only” 6’8″. 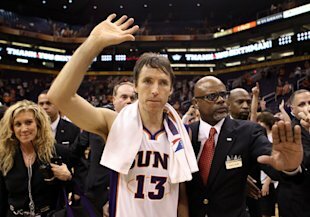 My favourite NBA player was, for a number of years, Phoenix Suns point guard Steve Nash. Then he became Los Angeles Lakers point guard Steve Nash and I decided that I didn’t love him quite as much. We’re signing Michael Beasley? Aye, okay, I’m off. It’s odd that I haven’t chosen a player for my team, the Houston Rockets. James Harden is spectacular. How many players in the league would I trade Harden for? Seriously, I’d debate you anyone other than LeBron and Durant. I also love the big goofy Turkish center, Omer Asik. Patrick Patterson is (was) great. Chandler Parsons is great. I’m really excited to see how Thomas Robinson does. But there’s just something about Faried. It could be the 40 points in the BBVA Rising Stars game that did it. The Manimal does not quit. It’s a total cliche to talk about players not taking a play off. Kobe Bryant has helped to reinvent NBA superstars attitude towards the grueling schedule. LeBron doesn’t take a night off. Wade doesn’t take a night off. Carmelo doesn’t (often) take a night off. KG doesn’t take a night off. Go back just a few years, in the post-Jordan, pre-LeBron era when Kobe was far and away the best player in the league (we could debate a few others, but there’s no denying Kobe’s career achievements, no matter how much you might not like him) and you would find plenty of superstars who mailed in the odd game/week/regular season. Manimal is all out intensity. You don’t grab 1,673 rebounds in your college career if you are not playing at a high intensity. But Faried is not just about rebounds. His rookie season saw him grab just under 10 a game. He also averaged one steal per game along with 12 points as part of a very respectable field goal shooting percentage of 56. Faried was certainly under-recruited. You don’t end up at Morehead State otherwise. Under his leadership, Morehead pulled off a huge upset of Louisville in the 2011 NCAA tournament. He was named a second team All American and the MVP of the college all star game in his senior season. Faried was drafted 22nd overall in the 2011 NBA draft by the Denver Nuggets, where he would backup then-starting centre Nene. Hindsight is a wonderful thing…BUT…let’s look at some of the players selected above Faried. Derrick Williams. Jan Vesely. Jimmer Fredette. Chris Singleton. Tobias Harris. Nolan Smith. 2011 was a weird draft year, particularly given the fact that it immediately preceded the lockout and was very foreigner-heavy. Isaiah Thomas was the last pick of the draft and yet is one of its stars. Greg Smith, who has become an integral part of the Rockets bench this season, was undrafted. Before the end of the season, Nene was traded to the Washington Wizards. Part of the reason was that Faried had so impressed the Nuggets coaching staff during his time as a starter while Nene was injured. In his first full season, Faried has been named player of the week, pulled down 20 rebounds in a game against the, admittedly less-than-aggressive-on-the-boards, Miami Heat and, this weekend just past, been named the MVP in the Rising Stars game.